Sparkles is coming back as Program Extraordinaire for summer 2012. Read on to find out why she’s returning and who/what she’s bringing with her! I’m coming back for another summer because I love camp! 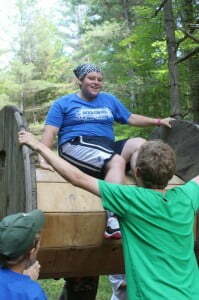 I love camp because it is a place where I found myself and felt accepted. It is a place that God opened himself to me in a way that I could feel. I love singing praise songs as much as I love singing silly songs. When I first arrive at camp there is an anticipation of all the fun that’s going to happen: swimming, slip n slide, group games, crafts, sleeping out, and the list goes on and on. Along the way these amazing friendships begin to form. It is these relationships that last throughout the year and keep me coming back. I keep returning to camp to have the chance to see old friends as well as create new ones. It’s a community of people that all work together. I cannot wait for this summer to meet many new faces and grow into a tightly knit opened armed extension of God’s love. Some may remember the infamous Dew the Bear, well he is coming back too, and he is going to be bringing his friend Dew the Hippopotamus. I invite and encourage you to return to camp and bring a new friend as well! See Dew, meet his new friend and experience a piece of, in my opinion, the best place on earth.